Video game shows and movies are almost always terrible. Ever since video games were first created there have been adaptations that either didn’t get released, were unfaithful to the source material, or were just plain bad. Many had given up hope on the idea of a good video game show, but when Castlevania was released last year, it proved to everybody that a video game show could be not just good, but great. It managed to create an interesting story with unique and varied characters all based off of an NES game. That was in addition to the great animation and the plethora of easter eggs and references all throughout the show. However, the first season was only four episodes, and by the end of those episodes had only just got the ball rolling. So, now that the second season of Castlevania has been released, does it surpass the original season’s surprising showcase? Without going too far into spoilers, season 2 takes place very soon after the ending of the original season. Trevor, Sypha, and Alucard are all together and trying to figure out the best way to go about killing Dracula. However, the trio isn’t the only group planning, as Dracula has made a war council to figure out the best way to end all of humanity. This war council consists of vampires from all around the world, one of which is a main Castlevania enemy, and is the second main enemy of the series. The two groups have a symmetry in the series, and it works well actually being able to see the vampire’s view and plans on the war. By going any further than that I would delve into spoilers, and believe me, this story is not one that should be spoiled. There are plenty of great moments, some good twists, and episode 7 of this season is one of the best TV show episodes hands down. One of the best things about the first season of Castlevania was the characters, and they’re all better here. The main three all get some character development in line with what was started last season, such as Sypha learning to be self-sufficient, Trevor learning to accept his destiny as a Belmont, and Alucard learning to reject his lineage. Dracula’s War Council is also great to watch, as all of the characters have unique designs and personality. It’s also interesting seeing the comedic relief of the Council, Godbrand, constantly get people annoyed at him, as he’s much less of a dark and brooding character than most, creating a great contrast. Castlevania season 2 continues with the dark and dreary aesthetics of the original. The world of Castlevania is one without hope, and it can be seen throughout the world. People look upset and just stumble along the roads, and corpses are found all around the place. Even in the backgrounds of scenes you can see that things are in disarray, and the world has gone to crap. A great thing about the Castlevania games is the music, and while the first season’s music was somewhat lacking, season 2 kicks things into full gear. There are a number of atmospheric tracks, but unlike with last season, there are songs and sound effects ripped straight from the games. These themes aren’t used too often, which highlights the importance of the moments when they’re played. Of course, when talking about an animated show, animation is a large part of the formula. 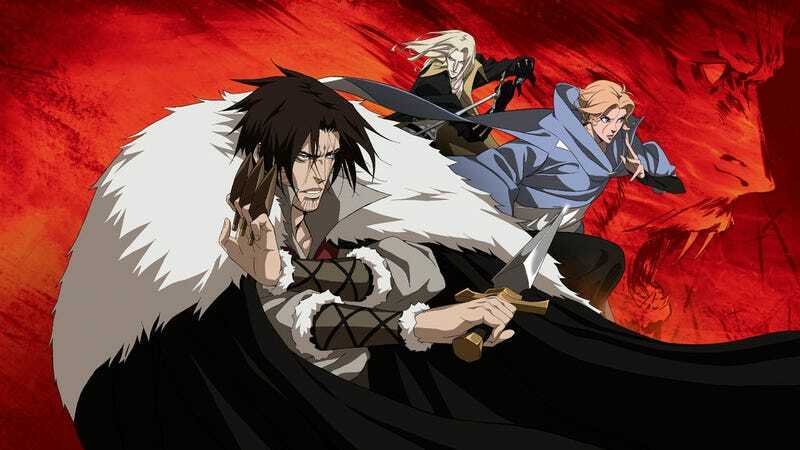 While the first season of Castlevania had some great designs and animation, the second season continues to improve. In the first season there were some small problems with the animation, or things looked slightly off. However, there aren’t any noticeable problems here in season 2. In fact, not only does the animation look better, but there’s fewer pointless scenes. Every scene is important in this season, even if it’s not at first apparent. These things are all just icing the cake of Castlevania’s fight scenes though. The fights in this show are beautiful, and every little bit is animated. When something in the background gets hit, you see the damage of the impact not just in the moment, but even when the camera returns to that area. The areas also manage to play into the fights, as they change how characters have to fight, forcing them to change up their usual strategy. Each fight scene also manages to be interesting by having each character use different abilities than other participants, and not the abilities you would first think of them for. As previously mentioned, the environment’s detail is spot on, but that goes for everything in the fights as well. Characters don’t teleport around the battlefield just for the fight like in other shows, and the looks of the attacks from everybody are amazing, from Trevor’s whip flying through the air to Sypha’s magic crackling as it flies across the area of battle. The first season of Castlevania was an amazing step forward in video game television, but season 2 perfected what it was trying to do. Everything is improved upon from the story, the animation, the references, and the overall presentation. Castlevania showed not only that video game shows can be good, but that they can be great. It managed to keep the spirit of the games, while expanding on the story with both new and old game concepts. While there were a few elements towards the end of the story that could have been more concise, the left over plot threads will be expanded upon in the confirmed season 3.